Are you ready to send some permanent records from your office to ours? If so, fill out the Records Transfer Form and attach it to the folder, box, or envelope of materials you have ready to go. You can have a work order move the materials to the Archives Workroom (B05) in the library or send us an email and we'll come pick it up. Archives Express kits help you set aside items for the Archives as you're managing or creating them! Keep the kit in your office or shared departmental space and as you come across something that should be transferred to the Archives, pop it in the box (or on the included flash drive)! When it's full, send it our way and we'll send you a new, empty kit. 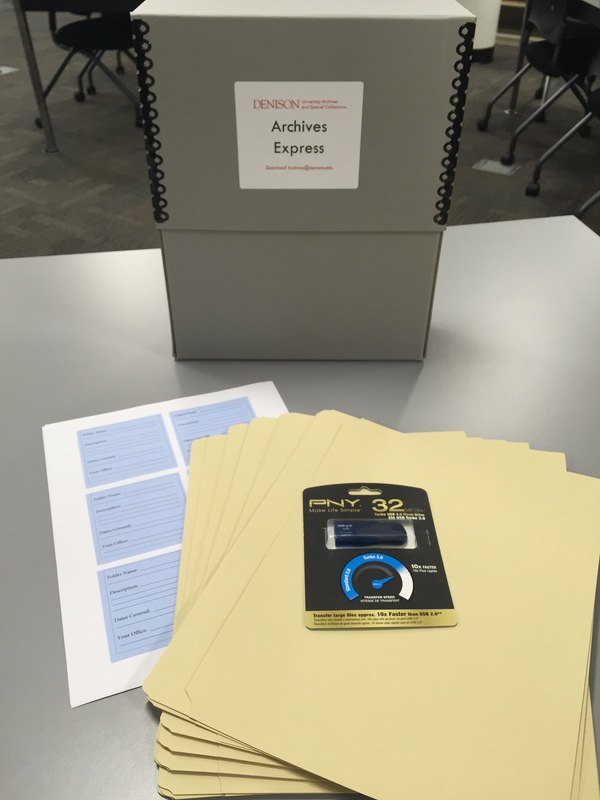 If you'd like to have an Archives Express kit in your office or department, just send us an email and we'll drop one off! For more details, see Archives Express Instructions.